Nobody seems to know as yet how many days it might take until the 13 adolescent males trapped inside a flooded cave in northern Thailand can be brought out safely, according to a senior government official on Wednesday. Rescuers have prepared equipment and mapped out plans to evacuate the 12 youth soccer players, aged between 11 and 16 years, and their 25-year-old coach from Tham Luang Khun Nam Nang Non cave in Mae Sai district of Chiang Rai province, about 860 kilometers north of Bangkok, where they have entered for a dozen days since June 23. A team of experienced British divers found the boys alive and safe after they had dived about three kilometers deep in the cave's strongly-flowing subterranean water, said Chiang Rai provincial governor Narongsak Osotthanakorn. Though rescuers could not predict how longer it will take for the boys to be evacuated safely, the provincial governor said they will certainly not do anything which might jeopardize the safety of the evacuees. 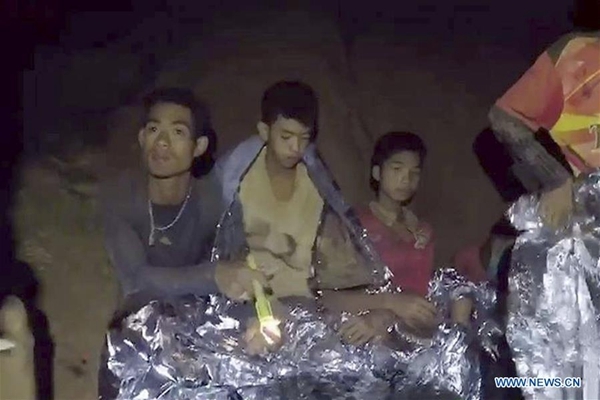 Navy Seal divers and paramedics have taken turns to closely take care of the boys who looked exhausted at a dry spot of the flooded cave with food, medicine and supplies. The provincial governor commented that rescuers could not as yet tell how soon the boys will be brought out safely due to "difficulties" doing so. The subterranean water in the cave was flowing so fiercely it apparently discouraged the rescuers from putting the safety of the boys at risk, according to Narongsak, who is currently in charge of the rescue mission. "For the time being, we cannot tell how many days it might take until the boys could be evacuated out of the cave safely," he said. While waiting for the flowing streams to subside, the Navy Seal divers were teaching the boys to dive with oxygen masks in preparation for the planned evacuation, he said. Nobody knows how many days it might take until the 13 footballers trapped inside a cave in Thailand can be brought out safely.